Today, Google celebrates Gerda Tero’s 108th birthday. I’m embarrassed to admit I didn’t remember her name. I’ve been a fan of Robert Capa since seeing an exhibit of his war photography as a teenager. I knew he had a “girl friend” photographer who was killed in the Spanish Civil War. I didn’t realize that she played a similar role to Einstein’s first wife in shaping his now-celebrated work. Both have similar war styles, but Tero seemed to have a lot more photos of women at war. And I mean at war. Women armed, women shooting in battle, etc. Her iconic photo appears above. 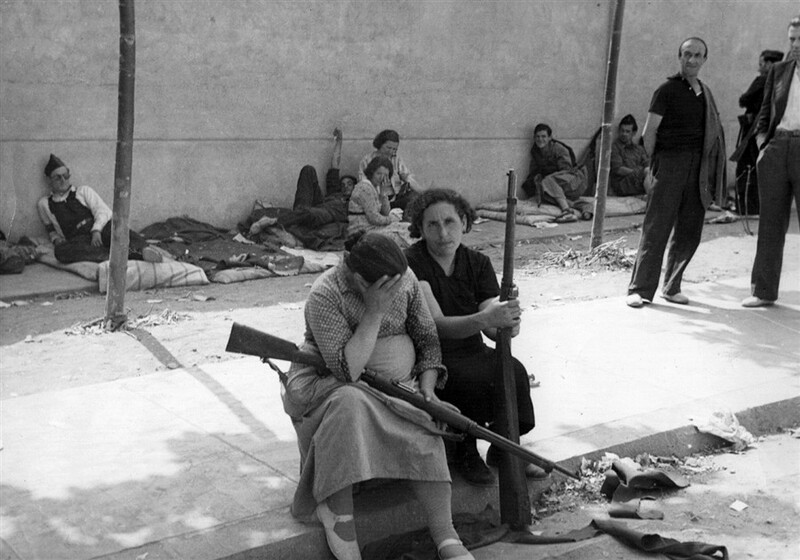 Women with rifles sitting on a curb from a Medium article. International Center for Photography has a gallery of her work. It’s also easy to find photos of Taro, since she lived with Robert Capa.